And to quote Sarah Ockler – a world-known author, “Nothing ever really goes away — it just changes into something else. Something beautiful.” Indeed, change is inevitable and is a constant phenomenon we all have to endure and embrace as we embark on our individual journeys. It is also a bittersweet fact that no matter how much we have loved our brand, eventually, the need to step and change things up will soon arrive. An improvement that will propel our best to become better, to be a class on its own, to outrun the competition, to serve you more. In 2010, after years of research and continuous development of what will be the next big thing in skincare industry, Yllume was finally born. Like most of us, Hossay Momand (Yllume’s Director and Founder) wanted to craft a highly effective and results-driven skincare range that is clinically proven and dermatologically tested to even-out skin tone, and noticeably reduce hyperpigmentation. True enough, all these goals and vision for Yllume realised. Since then, Yllume successfully launched, operated, and distributed its products to several countries across the globe. Through Yllume’s potent yet gentle combination of key ingredients, more and more consumers purchase the brand. Yllume then used the colour tone within the purple hue. The brand was introduced and made known on this colour range. Thus, it is not surprising to know that our patrons easily recognise and associate Yllume and its products because of the brand colour we used to carry. Yllume’s packaging and container presentation is another story. Yllume wanted something that is easy-to-carry, simple, yet ergonomically efficient to safely protect the contents. As a result, Yllume started with more of rounded edges and geometrically straight shapes. For years, our packaging has become one of the trademarks of the company. Come 2018, just as metamorphosis is the most profound of all acts, Yllume relaunched itself – brighter and with wider skincare range. This time, the brand came in full circle. From the dark colour tones, the brand now boasts a brighter, softer colour within the pink and rose gold color palettes. Still, with a touch of cool grey on the side to emphasise balance with the light and shade branding colours. Gone are the purplish trademark Yllume started with. Also, the packaging and product presentation remarkably transformed. From rounded and almost geometric container shapes, now, our product enclosures have become more sophisticatedly remodelled – a slightly curved middle part is truly an attention-grabber on our bottled products, a new blister foil wrap for our skin supplement capsules also sets a new identity. From a single grip of any of Yllume’s merchandise, one can easily tell that there is precision in the craftsmanship of every single packaging. Not that these changes are not yet impressive, adding to the complexity and intricacy of the new Yllume is the inclusion of the rose gold luminance on the colour branding. The radiant glitter of gold on our products is one of the many assurances that users get nothing but the best out of our skincare range. With all these, if you will still see yourself quite confused as you stroll the aisle of top shopping malls, dermatologists’ clinics, pharmacies, and other partner shops that we work with as you see Yllume written in a whole different colour and product exhibition, be surprised no more. Be guaranteed that Yllume is still the brand you fell in love with. Though changes may have found its way ashore, with Yllume, these are for the better. 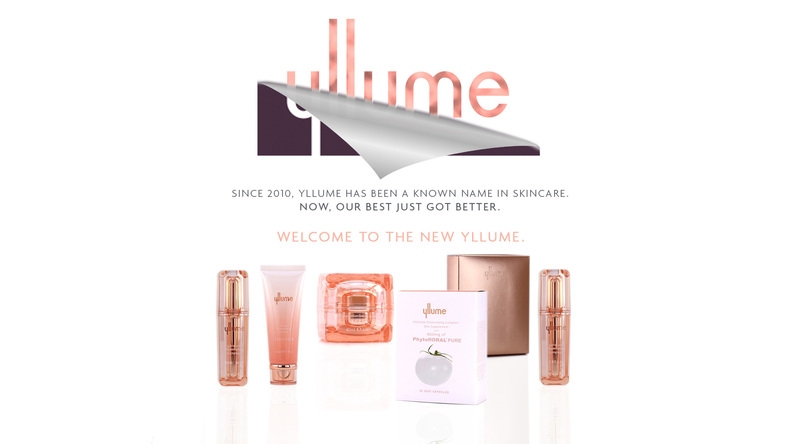 Welcome to the new Yllume – an answer to all your skin concerns. Even, brighter skin. Now.